The Chicago Retail Stores 3 (Part of the Retail Stores family of Growable buildings) is a Medium-Wealth Commercial Services Building that grows on all densities of Commercial zones. This building is part of the group of generic Medium-Wealth stores grouped under the Retail Stores name. 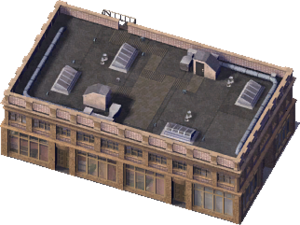 Mager Blueprints uses the same model sets and can be considered a Commercial Offices variant of this building. This page was last modified on 11 May 2014, at 05:52.